Elmet Farmhouse, a unique holiday cottage perched on the hill at Pecket Well, near Hebden Bridge, has been shortlisted for Welcome to Yorkshire's prestigious 2016 White Rose Awards. 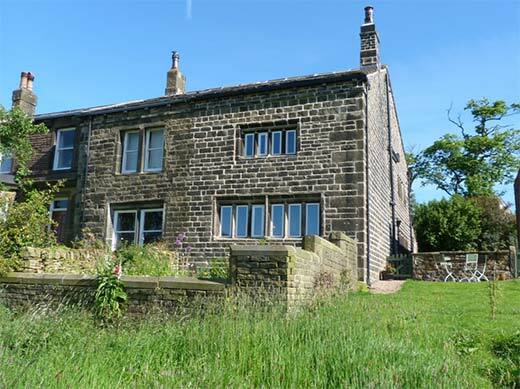 One of only 7 self-catering properties in Yorkshire to make it to the finals, Elmet Farmhouse, an 18th century farmhouse with bespoke interiors and spectacular views, beat strong opposition to make it onto the shortlist. Newly-restored, this handsome Grade II Listed yeoman clothier's house, with its beautiful stone mullion windows and quirky décor, has been attracting glowing reviews since its launch as a luxury holiday cottage 18 months ago. Design Historian Lesley Jackson, who oversaw the restoration, said, "I was bowled over to hear that Elmet Farmhouse has been shortlisted for the White Rose Awards. The farmhouse is furnished in a highly unusual way with a mixture of vintage furniture and fabrics, and wonderful lamps and wallpapers by Hebden's very own Hannah Nunn. Having stayed in many holiday cottages, I can honestly say that Elmet Farmhouse is a place like no other, inside and out! The view is simply breathtaking - like Turner in 3D, and features on the cover of Ted Hughes's Remains of Elmet." Sir Gary Verity, Chief Executive of Welcome to Yorkshire, said, "Once again the entries for this year's White Rose Awards have been exceptional across all categories, so a huge congratulations to those who have made the shortlist. As the largest celebration of tourism in the UK, the White Rose Awards are a fitting tribute to Yorkshire's fantastically diverse businesses that work tirelessly to help to make the county number one."